What do they call it at your radio station? Non-traditional revenue (NTR)? Non-spot revenue? New revenue? Vendor revenue? Regardless of the term you use, these days the most reliably profitable method of delivering revenue that doesn't come from radio ad sales is Event Marketing. Doug Harris is the master of Event Marketing. For years Doug has been my "go to" guy for radio promotions. His ideas are brilliant, easy to sell...and they make money for the radio stations that use them. Recently I was "in the room" as Doug taught the secrets of radio event marketing to a select group of marketing directors. As soon as the event ended I said, "You've got to do an audio seminar that teaches all radio promotion directors and marketing directors what 'event marketing' really is and how they should be utilizing it to meet their revenue and ratings goals." Here Is What Doug Will Teach You. Keeping a multitude of sponsors happy by employing "separate arenas of involvement"
How to avoid being strangled by "The Fine Print"
How to take advantage of the two types of "OPM"
Audio Seminar Really Is a "No Brainer." Are you under constant pressure to come up with more revenue- generating events...or to increase the financial return on your station's existing events? But it's not fair to expect you magically to have all the answers, to have mastered all the systems, to know where every last profit opportunity is hiding. You're a professional, and you deserve (and should demand) a professional-level learning experience devoted solely to Event Marketing. This is a detailed, intensive immersion into the world of radio event marketing. Your Study Guide will help you organize, understand, and remember it all. And because it's a PDF download, you can make copies for every member of your promotion and sales teams. With a creative legacy that spans 35 years, Doug Harris has earned a reputation as the world's premiere broadcast marketing consultant. He's worked his magic for radio stations around the world by creating powerful, promotions-driven ratings & revenue plans for delighted station owners while keeping their listeners entertained and their advertisers happy and grateful. Harris has created spectacular promotion successes for a wide variety of formats, including Rock, News/Talk, Oldies, CHR, New Age Jazz, AOR, and Classic Rock. His professional accolades include Billboard magazine's Promotion Director of the Year, numerous ADDY's, and three Promax Gold Medallion Awards for Marketing Excellence. 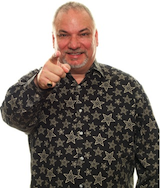 In short, Doug Harris is the guy you want to assist your radio station's Promotions or Marketing Director. Click the button below to add the Bigger & Better Radio Event Marketing to your wish list.